The Superdome field in partial darkness the NFL Super Bowl XLVII in New Orleans, Sunday. While the reasons for the 34-minute power outage during Sunday’s Super Bowl remain largely unknown, advocates for a smarter energy grid say it is the latest example of why the nation needs desperately to invest in its electricity infrastructure. 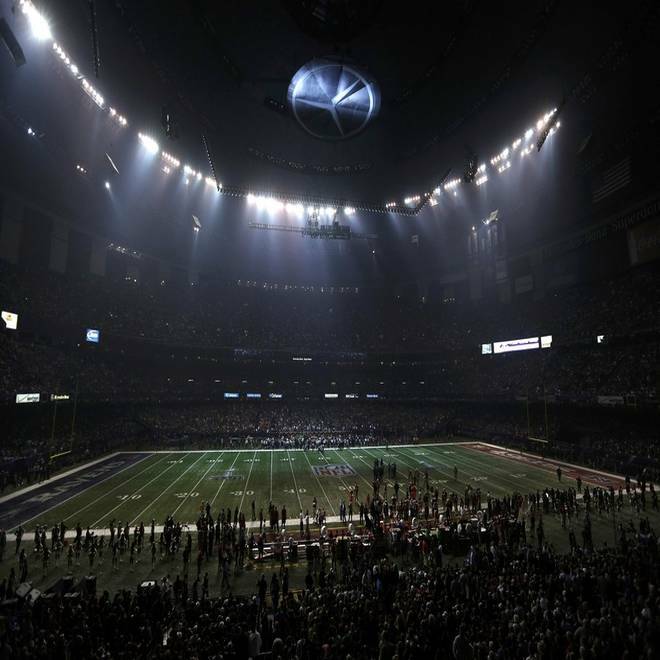 The blackout in New Orleans, coupled with the recent prolonged outages in New York and New Jersey caused by Hurricane Sandy, have put on display for the world how vulnerable America can be to losing its lights. Experts say it is a vulnerability that could have potentially crippling effects. “The grid has all these parts where accidents can occur, and many accidents have the potential to create widespread problems,” said Susan Tierney, co-author of a National Research Council report that details the flaws in how the country gets its power. She likened it to the nation’s interstate system, with main arteries and smaller back roads, so interconnected that a problem is rarely isolated. The National Research Council report, completed in 2007 but declassified by the Department of Homeland Security last November, warns that a coordinated strike on the electric grid could have devastating effects on the American economy and psyche. Along with the physical damage and darkness, an attack on the nation’s electrical grid could cause, the biggest impact could be devastating financially, according to Tierney. Like the roads and bridges that make up America’s physical infrastructure, its electrical infrastructure is getting more ancient. And University of Minnesota Professor Massoud Amin, an expert on the U.S. electrical grid, said our increasingly digital society is only causing more strain. “You’re dealing with an aging infrastructure that is not made for this century’s demands,” he said. Amin’s research shows America’s problems with electricity are getting worse. There were 149 power outages that affected at least 50,000 from 2000-2004, a number that rose to 349 from 2005-2009. Though questions surround what exactly caused the lights to go out in the Big Easy, Amin said he believes a smarter grid would have prevented the incident. He advocates for a self-healing infrastructure that can communicate when problems arise, anticipate potential issues and isolate the area where the problem arises. While energy experts and politicians on both sides of the aisle agree something needs to be done, little has been. “We’re not improving right now,” said Kelly. The reason, both Amin and Tierney agree, comes down to unwillingness in both the public and private sector to put in the cash. To create a smarter grid, money must go into things like research and development, security systems and standardizing equipment to allow defective parts to quickly be swapped out. With an increasing number of weather-related catastrophes that some have attributed to climate change, time is an even more pressing issue. Money is being spent repairing old electrical lines instead of on new technologies. A national smart grid could cost up between $338 billion to $476 billion over the next 20 years, according to a 2011 study by the Electric Power Research Institute. But the director of the University of Minnesota’s Technological Leadership Institute added that much of the investment has been stifled because, by-and-large, Americans are happy with their electrical service.